Well, after yesterday’s slow start I made sure today I was both up early and out early. I still can’t figure what happened. It was like I’d fallen asleep in my Corn Flakes, but there was no sign of milk on my nose and no flakes dangling from my beard, so I don’t think so. Maybe Thailand switched to Daylight Savings Time at 7am. That would explain it. But it’s unlikely. Anyways, after another quick walk on the beach, it was time to recce the Special Test and finalize my tulips. I bet that would confuse a Dutchman. I should explain, if I haven’t already, I decided to stay in a place called Pranburi. It’s just south of the Hua Hin/Cha Am tourist mess and only about 30kms from the potential venue of the test. Last June I stayed at the Golden Pines Beach Resort, and enjoyed the place. So I picked it again. Even the Manager remembered me. I could almost hear him muttering “Oh god, it’s that obnoxious farang again” but he smiled while he said it. It’s the Thai way. It’s always a good method of ensuring good service if you’re seen talking with the Hotel Manager! The hotel is across the road from a beach, just like my home, but about 550kms further north. The first thing I noticed is that everywhere is brown. It looks like Southern Spain in August. It can’t have rained for months, whereas at home, it’s hardly stopped. Bizarre. But I’m not complaining. Cloudless sunny skies are my thing. Except I’d forgotten how cold it gets at night without any cloud cover, and I almost froze to death at my early breakfast. According to Accuweather it was only 18degC. To me it felt like 18degF. Note to self: Be prepared; always pack a sweater. I sat next to the toaster to keep warm! Pranburi has definitely changed for the better since I was last there. On my previous trip, the sea wall and beach road were noisily being rebuilt following an intense storm that did a lot of damage. Trying to get anywhere near the beach, let alone walk on it, was almost impossible. Now, the wall is finished, a nice pathway, or bicycle track, or maybe it’s both, has been built, and peace had returned. They haven’t finished. It still looks somewhat sparse, but further down from the Golden Pines, grass is being laid and palm trees planted, so I think by mid-year it will look really pleasant. Pranburi – Much improved coastline, but still a work in progress. The area generally is much busier than during my last visit, which is a good sign for Thai tourism. 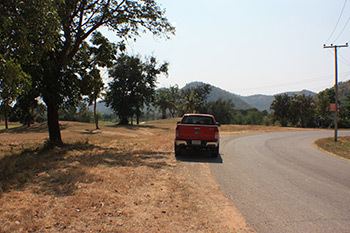 When I’ve finally finished with the Road To Mandalay rally next month I’ll have a 1300km two-day drive home from Mae Sot, so I may stay at the Golden Pines again. Anyways, I started my day by figuring out a more challenging road to reach the location of the special test and that took up the morning. 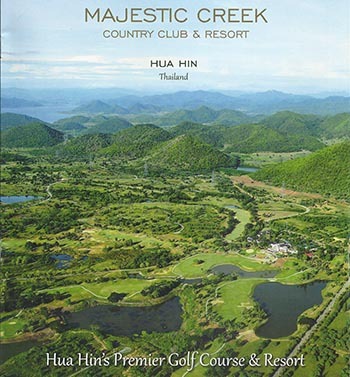 My friend in Bangkok had arranged a meeting with the owner of the Majestic Creek Golf and Country Club, and that wasn’t due to start until lunchtime. “The club has lots of land” I was told. No kidding. 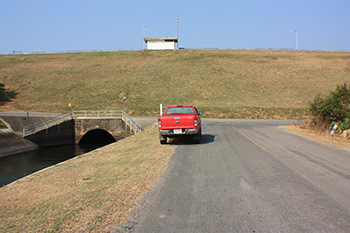 It’s three kilometers from the entrance just to reach the club house, and that covers only a small part of the property. It had been designed as a kind of residential golf club, with many roads and houses filling the spaces between the golfing bits. I’m sure there’s a better description than “bits,” but I don’t know much about golf; and what I think about the “game” isn’t printable. Majestic Creak Golf & Country Club from the air. Anyhoo, due to the economy, the roads were built but not much else. And since they are never used, the ones that were paved are falling apart, and the rest are still gravel. What could be better for a rally Special Test? After quick introductions we were able to take a look at the roads. There wasn’t much point entering into detailed negotiations if the roads weren’t suitable. But there was no worry on the latter score. They are just perfect. We quickly worked out a route of about 8.5kms. It’s a changing route, in that it starts on a wide paved road near the Club House, so that golfers can spectate if they wish, and then it gradually gets narrower and rougher and twistier and progressively more challenging throughout it’s length. I was very happy with that. I figured I couldn’t have designed anything better even if I’d started from scratch. So then we took an hour or so to reach an agreement … I won’t bore you with the details. I think it’s just a game business people play. I could tell the owner was happy for his land to be used and that it would bring some publicity to his club, and he knew I really wanted to use his roads. But you can’t just come straight out and say that. Negotiating must be done. The Start of the Special test at Majestic Creek. After the cordial chit-chat we went back through the test three or four more times to make and check the tulips. Then it was handshakes and back slapping all round, followed by a pleasant late evening drive through the countryside back to Pranburi. Tomorrow, will be a quick final check of the tulips for the road section, followed by a less pleasant 550kms south. Hopefully it won’t be another National Tree Felling Day, and that no more tires decide to explode, because I no longer have a spare! But for sure, the road won’t be any smoother. It’s quite incredible for a major link between Bangkok and the border. As I’m bouncing around on the ruts and bumps I find myself regularly whispering something that roughly sounds like “Farky Nell.” I’m not sure who Nell is, but I wish she’d fix the damned roads!